Blood is stronger than politics some might say: So when the US President says this to the New York Times —"Jared is doing a great job for the country. I have total confidence in him," then it is clear that allegations of his family ties with Russia will be resisted vehemently. 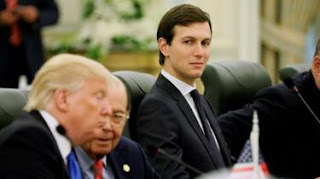 Not unexpectedly, Donald Trump has shown support for Jared Kushner his son-in-law, following reports the top White House aide tried to set up a secret and direct communication line with Moscow. Trump is firmly behind him. But the often controversial and outspoken POTUS did not directly address allegations made against Jared, who is married to Ivanka his eldest daughter. According to the allegations, It has been claimed that Mr Kushner when Meeting with the Russian ambassador last December, he suggested setting up a backchannel with the Kremlin. According to reports he was supposed to have done this while he was still a private citizen, before his Father in Law assumed the Presidency. No crime—yet? US investigators believe he has knowledge of relevant information, although he is not necessarily suspected of a crime for now. But the Trump family and Russia have been coming up increasingly since he took office. And firing the FBI director who was investigating the case only caused the scrutiny to grow.